Santiago Hernandez or José Ariza? I mentioned in my recent post about Jinty 4 October 1975 that the story “Barracuda Bay” is one that we’ve understood to be attributable to Santiago Hernandez, while saying that it was an attribution I didn’t necessarily ‘get’ until I read the issues of Sandie that included “The Golden Shark”. The two stories both showcase a lot of scuba diving, so there are obvious elements to compare directly. There are also drawings of the two protagonists looking quite similar across both stories. Finally, in “The Golden Shark” in particular, there are other characters who look very similar to ones in “The Haunting of Hazel”, which is confidently attributed to Hernandez. 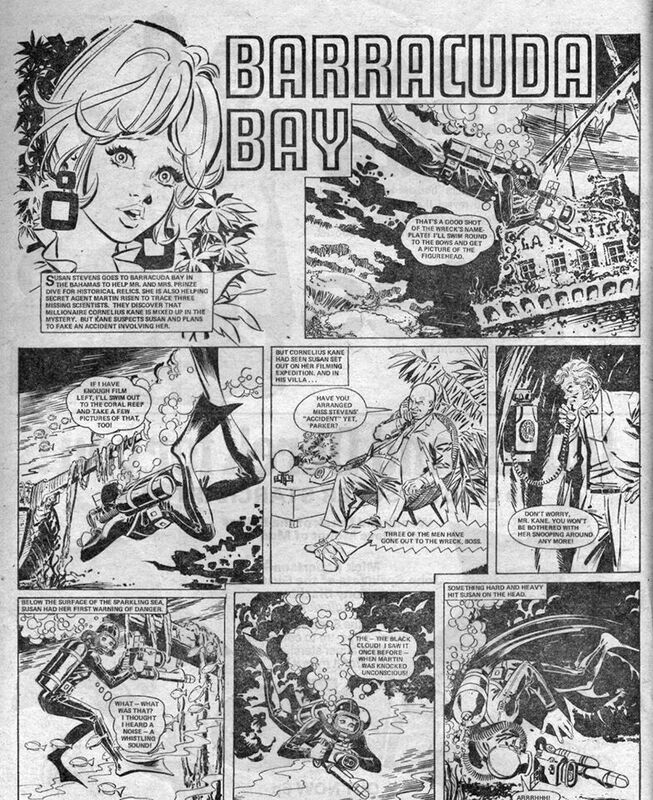 Mistyfan draws my attention to another possible artist that could be a contender for the creator of “Barracuda Bay”: José Ariza, who you may know from his work in Misty or in DC Thomson’s Emma (he drew wartime thriller “The White Mouse”). What elements of the artwork can help to decide between two artists? There are lots of small things to look at: noses, eyes, hands. To me, there are many similarities between the at on “Barracuda Bay” (henceforth BB) and on “The Golden Shark” (henceforth GS). The eyes and mouth on the character in the logo on panel one of BB looks very similar to the scuba-diving character (for instance in the bottom middle panel of of the first page of GS). 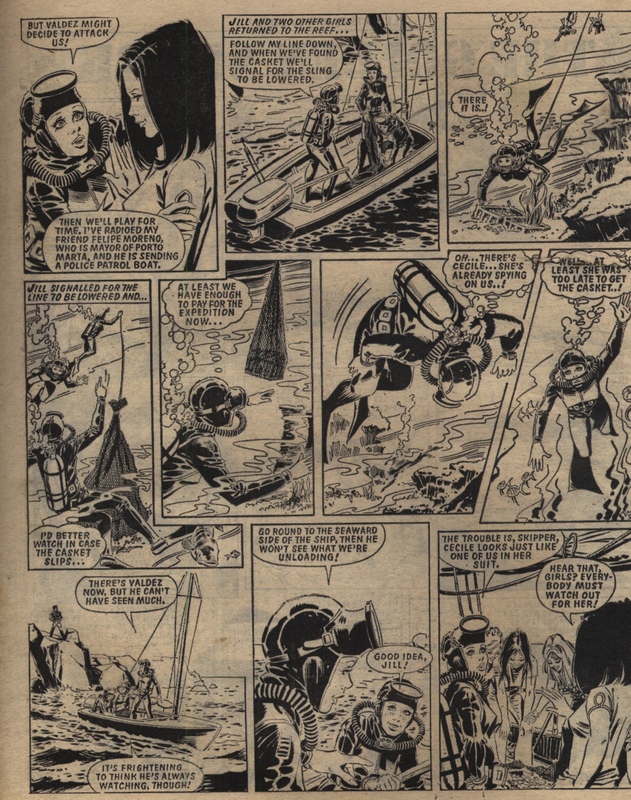 And generally, the scuba diving art in the two stories matches very well, so I have no real doubt that these two stories are drawn by the same artist. Triangulating with “The Haunting of Hazel” (henceforth HH), again there are matching elements: the hairstyles in GS and in HH share a lot of traits, such as the styling of the characters with the black bobs, who all seem to have fierce, floating hair. GS is less tightly drawn than either HH or GS, though. But what about Ariza? 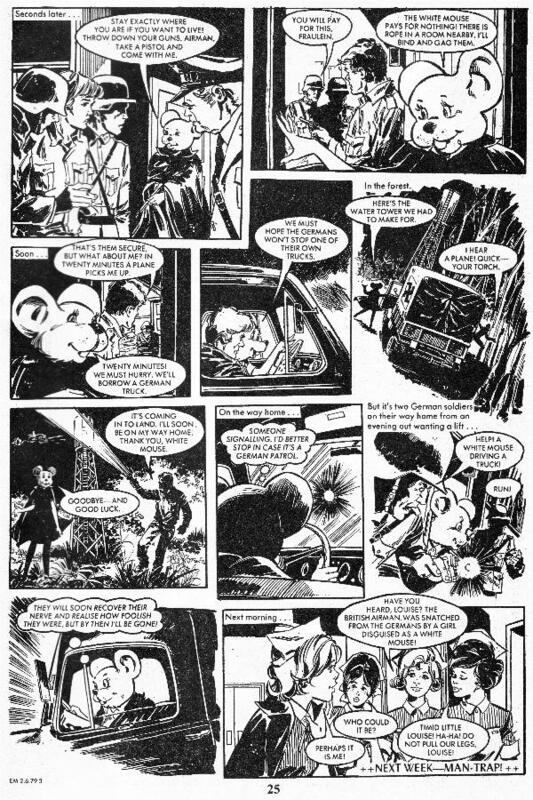 Mistyfan draws attention to the detail of the eye of the White Mouse on the second page of that story: I would also highlight the pose of the nurse’s body in the first panel of the first page, along with the mouth of the nurse in this story. There’s no exact match of them with the Barracuda Bay art, but they feel similar in style nevertheless, as if you could imagine them belonging on the same page. I don’t feel at all the same about “Vengeance is Green”, though – the hairstyles in particular are much curvier and bouncier than those in HH and GS. Barracuda Bay has fewer visible hairstyles apart from in the logo picture, but there again I would call that wispy in a way that matches HH much more than the very ‘full’ hairdos in “Vengeance is Green”. What do you think? On the basis of this comparison, I am happy with the assignment of “Barracuda Bay” to Santiago Hernandez, though I will certainly grant the similarities when set next to “The White Mouse”. But if “Vengeance Is Green” is more typical of Ariza’s art then I would see rather more differences than similarities between his work and “Barracuda Bay”. What details would you concentrate on? Or, what larger features would you look at to decide this sort of question – whole-body poses, page composition perhaps? None of it is an exact science – let’s have your views. Katie the Jinx had a break last week, but as the cover shows, she’s back now. This week she’s trying to sweep down a cobweb that’s in a difficult position to reach. She succeeds in the end, but leaves the place in a worse state than when she first started cleaning it. Typical Katie! It’s not every day in girls’ comics we see an unsavoury girl being straightened out with a good spanking on the bottie. Yet that is the case here in “Hetty High-and-Mighty” here, and you’ve got to love it. Next, Hettie has got to help the school win the match or she will hear it from her stepmother again. Trouble is, can Hettie pull it off after a dog bite makes her go lame? Lyndy and Lucy have broken out of the House of Candles, but things aren’t going smoothly. Mrs Tallow sets the Peelers on them, claiming they are thieves, and Lucy’s been injured! Moreover, Mrs Tallow is off on another robbery with her accomplice in the mystery coach. Fortunately Lyndy gets on the trail, but can she stop the robbery? Una gets help for the sick Finleg. She soon realises he’s been poisoned by despicable Dora and swears vengeance. However, Una’s attitude changes when she realises Dora’s unknowingly put herself in danger when she finds the stolen money. In “Golden Dolly, Death Dust!”, Miss Marvell’s bid to split up the girls has failed, but leaves Lucy’s mother a nervous wreck and she has to take a break in Cornwall. Mum’s lucky – soon everyone’s a nervous wreck when they see the latest damage the death dust has caused. Mum’s pride gets worse for Ping-Pong Paula. They have to find new accommodation but silly old Mum would rather sleep in a field or – as it turns out – the night refuge shelter, than swallow her pride and go back to Dad. Even relatives are fed up with Mum’s stupidity. But worse is to follow – Paula gets news that Dad’s garage is failing! Nell finds she’s being virtually blackmailed into staying at the academy and being turned into a refined young lady. She doesn’t make a good start either – she gets herself dreadfully dirty by cleaning filthy pots, not realising that they had only been put out to be disposed of and were not meant for cleaning. What an embarrassing start, but then things look up when she finds a friend. More weird things happen on Black Crag, but Hazel is convinced explosives, not the curse of the mountain, are responsible. Whatever the cause, it’s not making things easy for her mountaineering group. In “Song of the Fir Tree”, Dad’s a bit caught up with getting help for the injured Strang and getting information from him about his children to look for them at the moment. Meanwhile the children take refuge in a railway station, but Grendelsen isn’t far away, and now thieves are attacking the goods trains. Following up on the previous post on European Translations, Sleuth from Catawiki has kindly sent me a list she has prepared of Jinty stories which were translated into Dutch. (See also some comments from her in that post, about Dutch translations.) They were mostly published in the weekly comic Tina and/or in the reprint album format Tina Topstrip. The list below shows the original title, followed by the title in the Dutch translation, with a literal translation in [square brackets] where appropriate, and then the details of the publication that the translation appeared in. It is ordered by date of original publication. 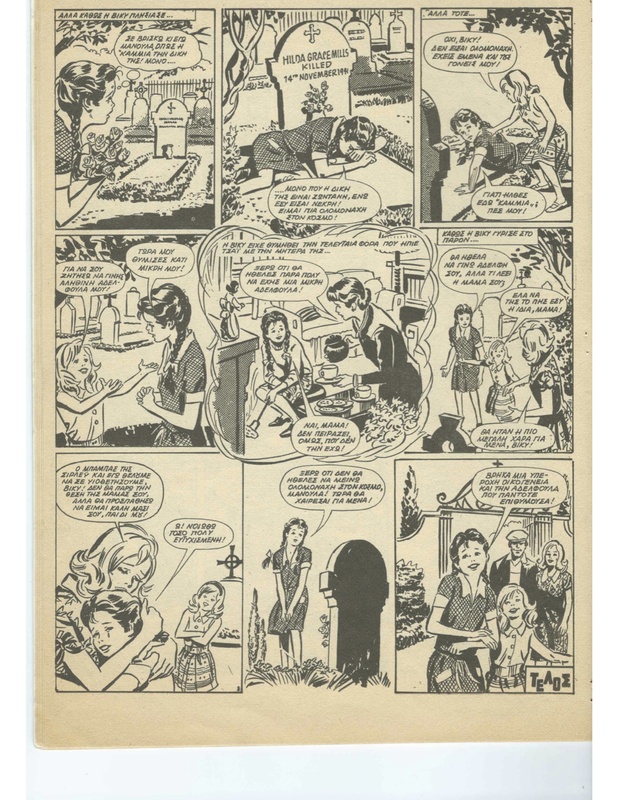 Tricia’s Tragedy (1975): Tineke – Strijd om de Lankman-trofee [Tineke – Fighting for the Lankman Trophy] (in: Tina 1975/76, Tina Topstrip 18 (1980)). Barracuda Bay (1975): Susan Stevens – Barracudabaai (in: Tina 1971); reprint from June & School Friend 1970. 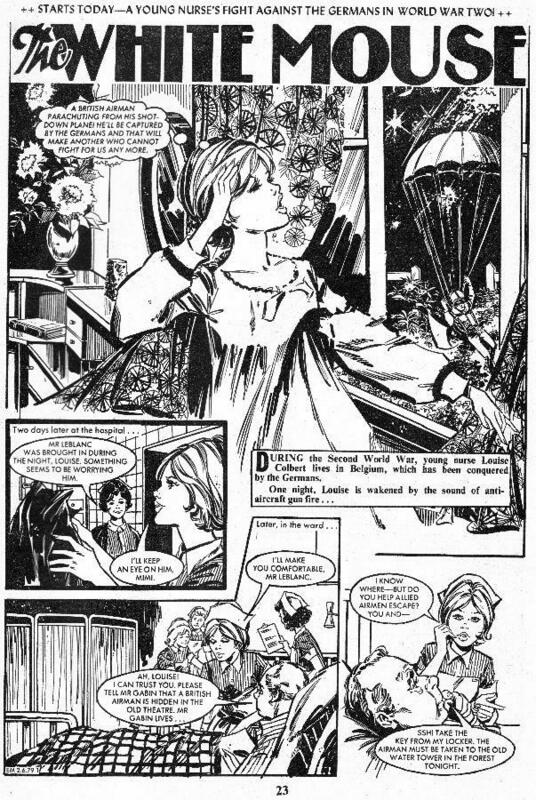 Girl in a Bubble (1976): Gevangen in een luchtbel [Prisoner in a Bubble] (in: Tina 1977, Tina Topstrip 29, 1981). The Mystery of Martine (1976-77): De dubbelrol van Martine [Martine’s Double Role] (in: Tina 1978). The Robot Who Cried (1977): Robot L4A ontsnapt! [Robot Elvira Gets Away] (in: Tina 1985/86). Fran’ll Fix it! (1977; 1978-79): short story 3/4; Annabel versiert ‘t wel [Annabel will fix it]; episodes in Tina from 1983 till 1994; there were also “Dutch” episodes written by Bas van der Horst and drawn by Comos, and there is an episode in 1994 written by Ian Mennell and drawn by Comos. 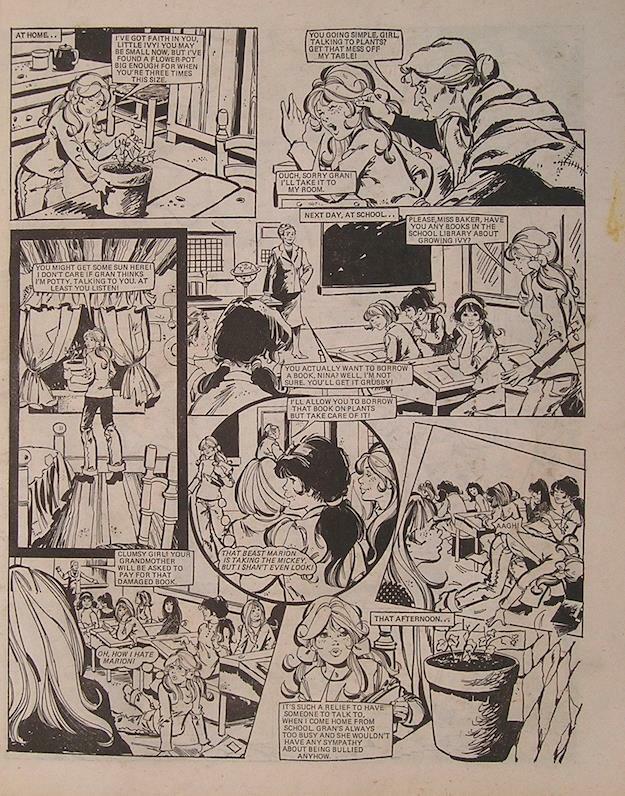 The Goose Girl (1977): not translated directly but the storyline was probably used for Maartje, het ganzenmeisje [Marge, the Goose Girl] in Tina 1979, art by Piet Wijn; Tina Topstrip 40, 1982). 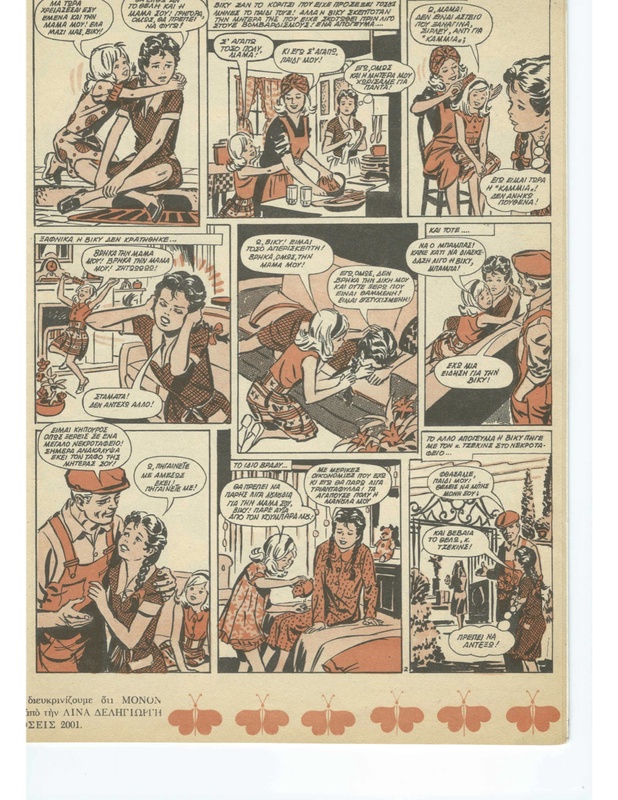 Paula’s Puppets (1978): De poppen van Petra [Petra’s Puppets] (in: Tina 1979, Tina Topstrip 54, 1983). Perhaps they changed the name because there was a Stewardess Paula strip in Tina at the time. The Birds (1978): De vogels (in: Groot Tina Boek 1978 winter). The Human Zoo (1978): Als beesten in een kooi [Like Animals in a Cage] (in: Tina 1986). Reprint in Tammy 1982. Bizzie Bet and the Easies (1979): Dina Doe douwt door [Dinah Do Pushes Through] (just one episode, in: Groot Tina Lenteboek 1982-1). Seulah the Seal (1979-80): Sjoela de zeehond (in: Tina 1980/81, little booklets in black and white that came as a free gift, stapled in the middle of a Tina). Various of the stories translated in Tina were also reprinted in the Indonesian title Nina (of course Indonesia is a former Dutch colony, making for a clear link). These will be listed on a new reference page for Translations into Indonesian. This long list enables us to see how very popular some creators were – for instance, a large number of Jim Baikie and Phil Gascoine stories are included (though not all, by any means). Of course, these were also the most prolific of Jinty artists too. Many stories were translated very shortly after initial publication, and then reprinted in album form some time later. There was also a ‘second round’ of translation work done after Jinty ceased publication, to go back and pick some of the earlier stories that had not been selected earlier. This was the case with “Always Together” and “The Kat and Mouse Game”, for instance. Many but by no means all of the story titles were translated fairly literally or exactly, though the main character’s name was almost invariably exchanged for another one. Some titles ended up particularly poetical or neat in translation: “A Spell of Trouble” and “Holiday Hideaway” perhaps benefit most from their translated titles. Of course, there are also some losers: I think “The Human Zoo” and “The Girl Who Never Was” ended up with less resonant titles through the process. A wide range of stories were translated: spooky stories, humour stories, science fiction, adventure, sports stories. There are some omissions that I’m surprised by, though of course the editors had to pick and choose from so much that was available. “Fran of the Floods” was probably too long (see Marc’s comment about the length of stories selected for translation). No Gypsy Rose stories were selected – maybe they didn’t want a storyteller, ‘grab-bag’ approach? I am however quite surprised at the omission of the excellent “Children of Edenford” (1979). Could it have been too subversive a story, with its underlying theme of adults undermining their position of trust by hypnotizing children in order to control their moral development? The similarly-themed “Prisoner of the Bell” was also not translated. Of course this is rather a guess! At the end of the day I’m sure there were just more stories to choose from than there were spaces for publication. 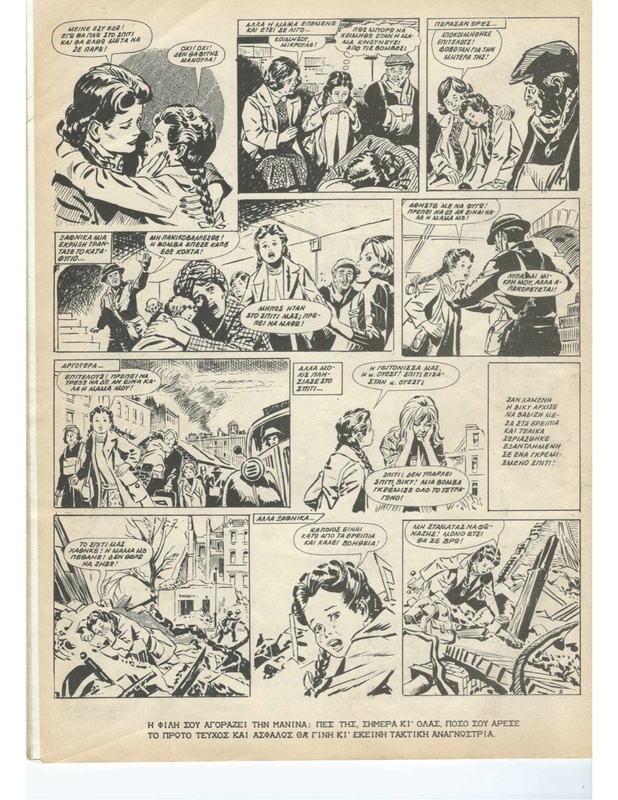 The work done by writers and artists in comics like Jinty was typically on a work-for-hire basis, with a flat fee being paid and no expectation of earning royalties on reprints or translations and so forth. The artwork was owned by the publishing company and not sent back to the artist. 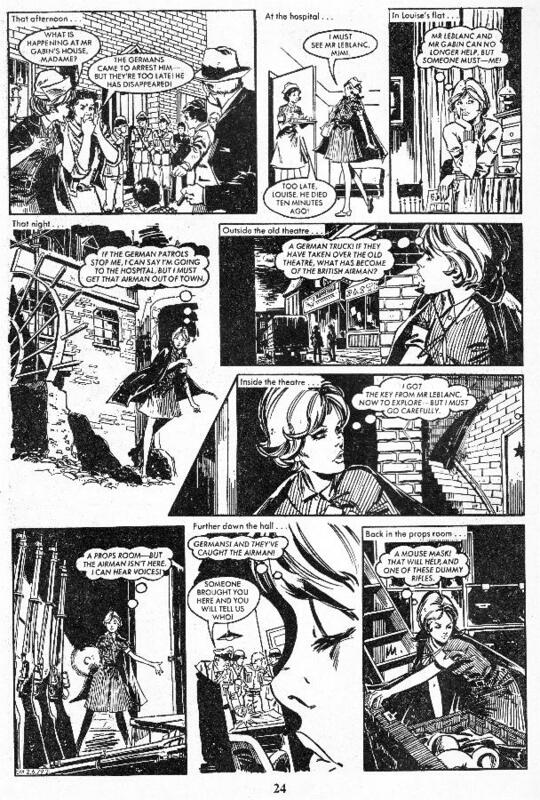 A lot of the communication we’d perhaps expect to be happening was just not on the cards: for instance it does not seem that Alison was very aware of the extent of her stories’ popularity, and certainly she was not aware that “Stefa’s Heart of Stone” was reprinted in Princess in 1984. (Indeed, in a reply to a reader’s 1981 letter, this story was described as one of Jinty‘s most popular stories.) Translations into another language were presumably something that creators were unaware of the existence of, except as a vague possibility. However, it is clear that there was a lot of this translation going on over the years, in many directions. 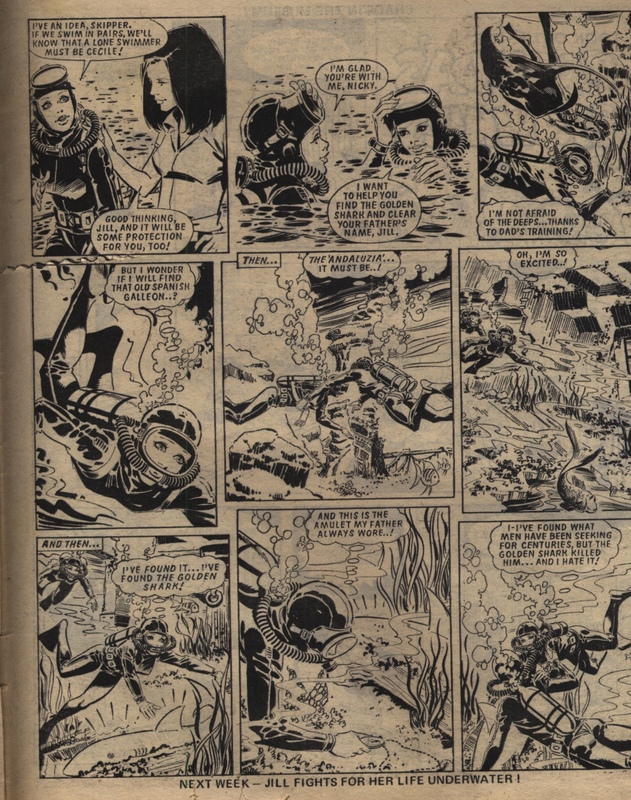 The Dutch auction site Catawiki is an invaluable resource for many British comics but particularly so for this question; although details are not all complete in every cases it lists stories by issue, artist, writer, and original title. 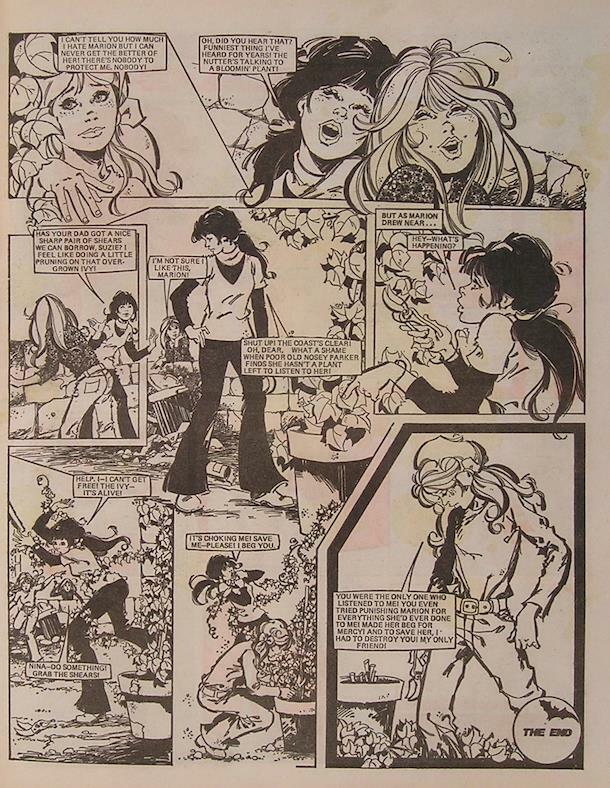 Many stories were reprinted in the Tina series Tina Topstrip, as albums collecting the whole story with a new cover. Usually the protagonist was also renamed to something locally suitable (so the protagonist of “Becky Never Saw The Ball” turned into “Eefje”). 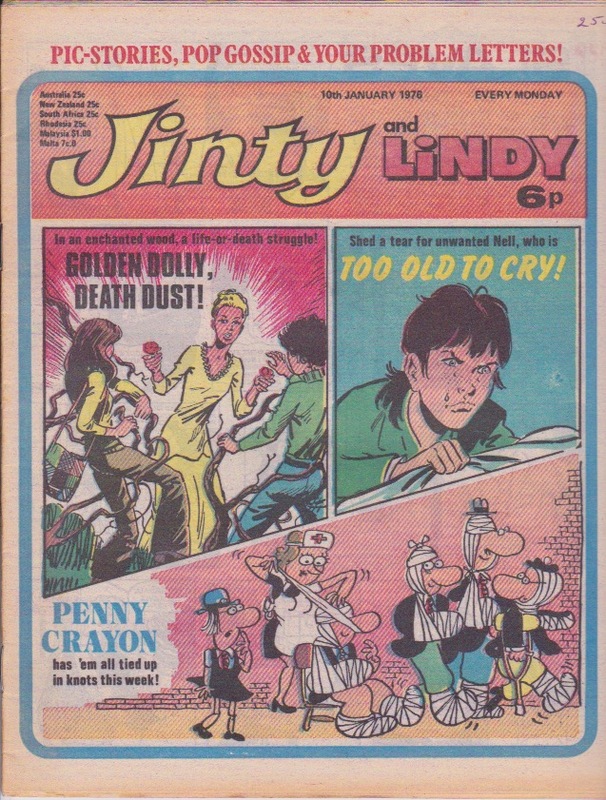 There was also a monthly magazine, Tina Club, which reprinted stories in an anthology format with what looks like a couple of stories in each one. 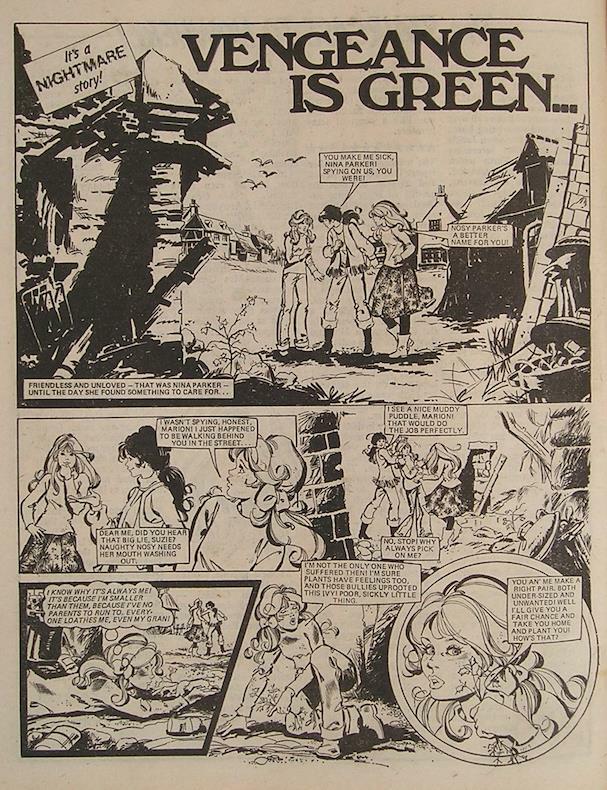 For instance, “Gwen’s Stolen Glory” was translated as “De droom van een ander / The Dream of Another” in 1975. Some of the individual Tina Topstrips I have looked at on Catawiki are listed below. 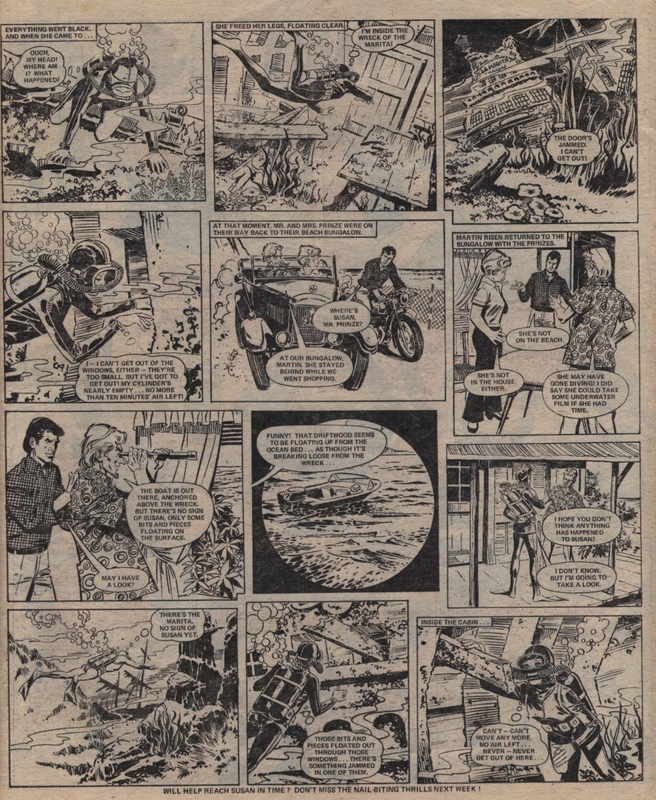 As can be seen from the above list, a number of the Jinty creators were represented in these Dutch translations – prolific artists Phil Gascoine, Jim Baikie, and Phil Townsend were all published in this series, and popular writer Alison Christie is represented too, along with Pat Mills. Nowadays the flow of material will presumably be more likely to go the other way, if at all (Trini Tinturé has recently had original Dutch material being republished in UK magazine Girls & Co). I would also love to know whether this was limited to Europe or not? Once you’ve translated material into Spanish or Portuguese then Latin America becomes available as a market, but it is a lot further away for connections to be made and that may well just not have happened. 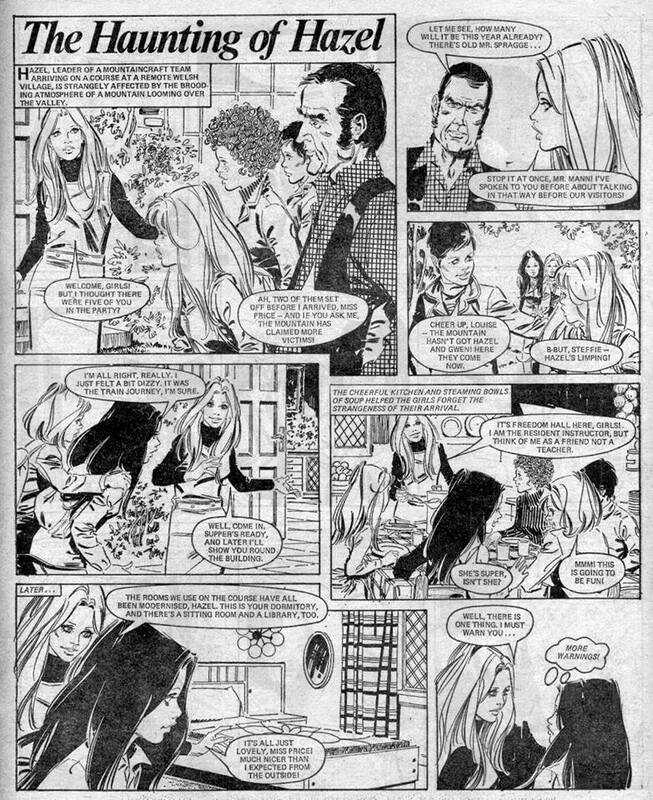 I know that Brazil and Mexico have their own local comics publishing traditions, as does Argentina (I don’t know about the other Latin American countries), with quite a different feel from the British weekly comic. Certainly in Brazil and Mexico if you see a foreign translation then it is very likely to consist of American reprinted material: Disney material such as the Donald Duck stories, and the Harvey comics such as Little Lulu and Richie Rich. 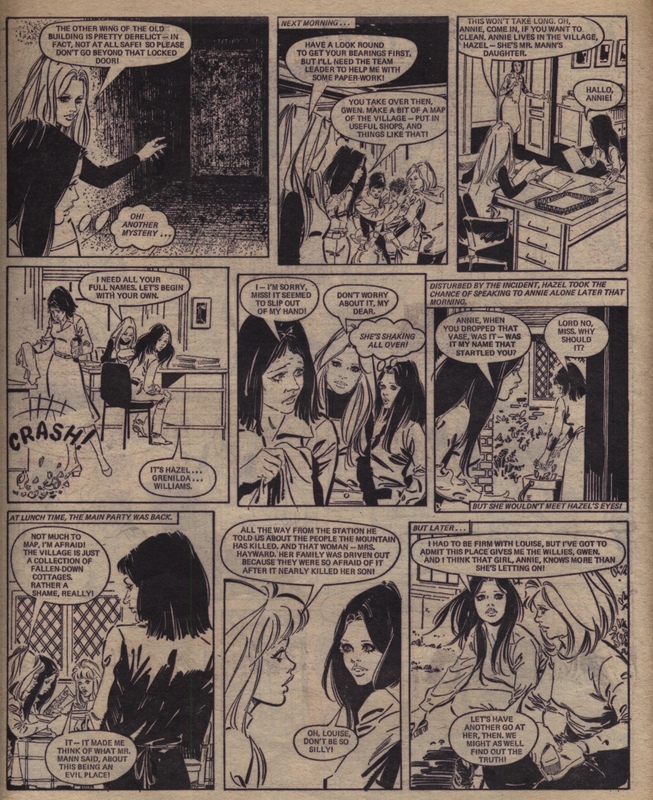 Marvel and DC also make a strong showing in those markets, but the sort of emotional long-running story seen in British girls comics is not very prevalent as far as I know. They would match well with the interest in telenovelas (soap operas) but perhaps this connection is one that was never made? I have never closely looked at the translations done in the Netherlands. My impression is that stories are usually complete and properly translated, although the names are often changed (“Patty’s World” is translated as “Peggy’s wereldje”, probably because there already was a “Patty” strip in Tina at the time). Having said that, I should compare “Gail’s Indian Necklace” to the translation: reading the story in Jinty I found an episode in London with Gail travelling the tube that might have been taken out as it seemed new to me. Perhaps too outlandish! They always tried to make it look like the stories took place in Holland. That did not work for the school stories with all the uniformed girls of course (no uniforms at school here). I read somewhere that a girl had even asked her parents to send her to boarding school because of the stories in Tina. She did not like it very much when she got there. Boarding schools here are for children whose parents are travelling or for children with behaviour problems or illnesses which cannot be taken care of at home. Another story that I should compare one of these days is “Maartje het ganzenmeisje” (Marge the goose girl). The story very much resembles the story of “The Goose Girl”, but the story takes place in Holland and is drawn by Dutch artist Piet Wijn. This is the first in a new category of post, covering the various story themes seen in Jinty in more detail. As we will see, the story themes are often not clear-cut; many themes overlap or become fuzzy at the edges when investigated further. Nevertheless, definite strands can be traced. 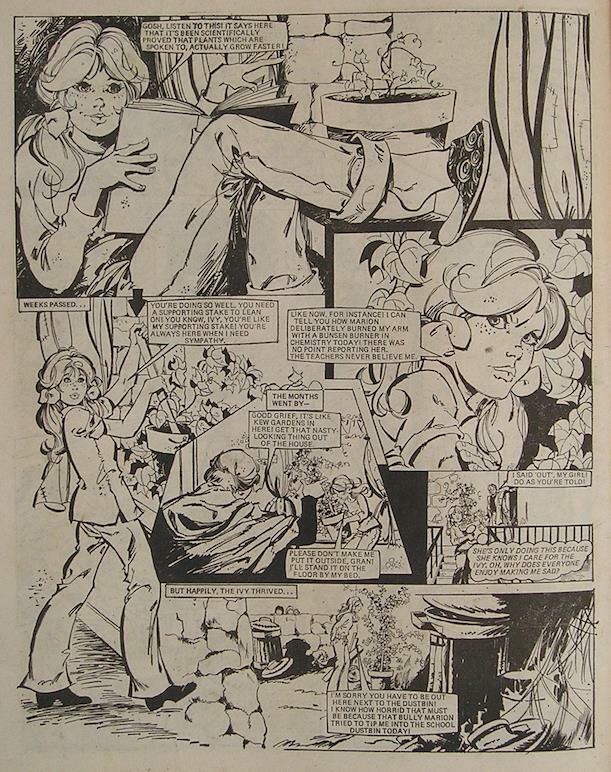 There is a long-running story theme in girls’ comics based around someone or something (normally an object) influencing the protagonist to do things she normally wouldn’t do, in a way that is supernatural or unnatural. The influencing object usually has its own agenda, and in service of this it often ends up taking away the protagonist’s free will, and perhaps even her memory, such are the extremes that are gone to. The object (or, sometimes, person) is often evil, though sometimes it can be just driven by its own underlying requirements, which the protagonist must serve in order to resolve the situation. Gail’s Indian Necklace (1974): Gail acquires a mysterious necklace made of wooden beads in a jumble sale: it originally came from India. Initially it grants some desires that are unspoken, or socially wrong: she cannot afford a bicycle and so the necklace makes her steal one, or she wants her aunt out of the way and the aunt gets knocked over by a car. The necklace has a specific agenda, to be returned to its original location; once Gail complies she is free of its influence and is even rewarded by it. Slave of the Mirror (1975): Mia Blake finds an old mirror in her house and it makes her turn against her sister. The mirror possesses her and makes her destroy things in the house, sabotaging her sister’s attempt to run a boarding house. It turns out to be haunted by the ghost of a Spanish serving-girl who was ill-treated by a previous owner of the house; her spirit is set to rest and the possession stops. Spell of the Spinning Wheel (1977): see above. Creepy Crawley (1977): Jean Crawley comes across an old scarab brooch in a shop; it comes with the promise that it can help her defeat her rival. She doesn’t stay around long enough to listen to the associated warning she would have been given: once it gives her her wish it will go on to further its own ends, up to and including a reign of insects! Very soon she is unable to give up the brooch or gainsay it in any way; the defeat of the evil object has to be done by a friend of Jean’s, and by the rival herself, who has to be persuaded into forgiveness to break the spell. Come Into My Parlour (1978): Jody Sinclair is made to wear a cat’s-paw necklace by an evil witch, who uses it to get revenge on the descendents of a judge who hanged her wicked ancestor. At first she is made to do things against her will as if she were a puppet, but her inconvenient conscience is eventually eliminated by changing her personality entirely. In the end she is only freed when the house that the witch has been living in is burned down, with the witch inside. The Venetian Looking Glass (1980): the protagonist finds a hand mirror which starts to control her life and wreak its revenge, ultimately being revealed as due to an angry ghost. As with other stories above, the spirit can only be laid to rest with the help of a wider group of people than just the enthralled protagonist, and forgiveness plays an important part too. A number of Gypsy Rose stories also include this story theme, with a more diverse set of evil or haunted objects such as a handkerchief and a tambourine. Of course, there are always fuzzy edges around definitions, with examples that don’t match the story theme quite as obviously. Looking at these less clear-cut cases can help to challenge our definitions. “The Haunting of Form 2B” (1974) has a whole class being haunted by a ghostly teacher. The schoolgirls are taken over mentally by objects given to them by the ghost, but it’s quite a number of varied objects that are influencing them rather than a specific one or two. In “The Haunting of Hazel” (1975) the protagonist is strongly influenced by a ghostly ancestor, but it feels more like a standard ghost story than a case of possession. In “The Mystery of Martine” (1976-77), the source of the possession is not very clearly delineated: is it the bangles that Martine clanks together, or is it the script written by the playwright, or is it all perhaps in Martine’s mind? Sometimes the object is not that clearly evil, or has an influence without appearing almost anthropomorphic. Tamsin Tregorren finds a silver comb that belonged to her mother in “Combing Her Golden Hair” (1979) and the comb shows her visions and leads her to frolic in the water like a dolphin despite never having learned to swim. Eventually she is brought to the sea where she meets her mother, who is a mermaid, and who wants her to come and live in the sea too. The comb serves the agenda of the mother, who is not evil (and though she is portrayed as selfishly not caring whether or not Tamsin would be able to survive in the same environment, this is never actually proven one way or another). In “Child of the Rain” (1980), Gemma West is strongly affected by the rain after a trip to the Amazon rainforest; it is found that some bark from a tree was left in her leg after an accident in the forest, and it is that that is affecting her, rather than any evil object or tennis-mad spirit . In “Who’s That In My Mirror” (1977), the special mirror in question does not remove Magda’s free will, though it does seem to tempt her to worse and more selfish actions than she would have done alone. It’s also not entirely clear at the end whether perhaps the mirror might be intended as an ultimately moral force, to make her repent of her selfish deeds? Hypnotism and brainwashing are the keys to “The Slave of Form 3B“, “Prisoner of the Bell”, “Children of Edenford“, and “Jackie’s Two Lives”: the active agents are people, working in ways that aren’t actually strictly realistic but can’t be classed as supernatural. Wish fulfillment: “Dance Into Darkness” has the protagonist forced to dance whenever music plays, with her free will eroded by the curse she takes on. It could be classed along the same double-edged gift that tempts Jean Crawley, but it feels more like irony than evil. And of course a wish fulfillment story can also be purely mundane, such as in “Food for Fagin” and “Freda’s Fortune”. Not to be confused with: a magical companion, who persuades or helps rather than forcing or tempting. Stories with such a companion include “Guardian of White Horse Hill”, “Her Guardian Angel”, “Daughter of Dreams”. The companion may leave the protagonist in a sticky situation but she is not compelled or possessed. It’s an old-fashioned sort of story theme, in many ways. The magical objects in question are typically very gendered – mirrors, necklaces, a brooch, a spinning wheel. 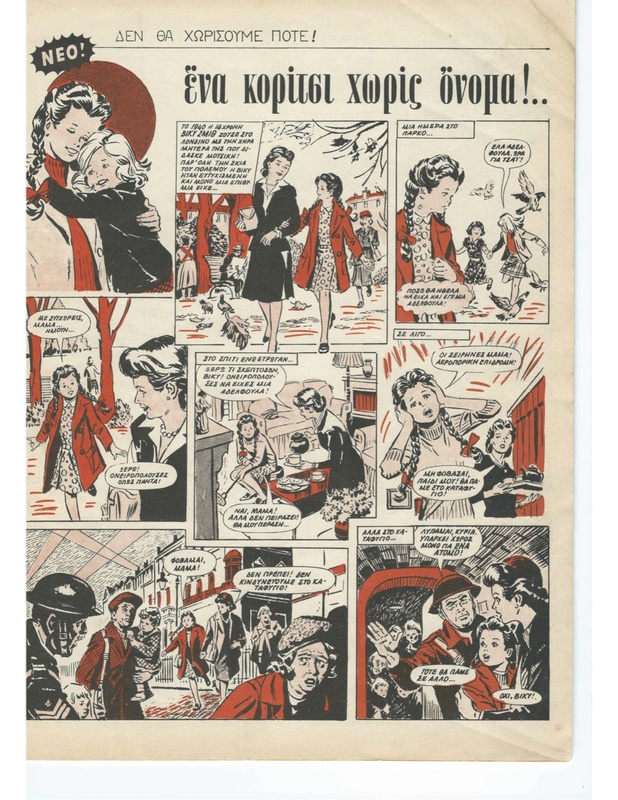 It feels like a trope from old stories or fairy tales, continued on in girls’ comics as a morality tale. The girl who is affected by the evil object often picks it up initially for the wrong reasons, or is in places she’s not supposed to be: the object promises revenge or oneupmanship, and the seeds of the main character’s undoing are sown because they are heading in the morally wrong direction from the start.